Bike-Ability week! The majority of children have had the opportunity to learn key skills to improve their cycling on the roads. They have taken to these lessons incredibly well and are thoroughly enjoying improving their cycling skills as well as the road safety. We are continuing with our work on Beowolf in English lessons and we have started our new Class Reading book of 'Wonder', which is an incredible story about a very brave little boy in Year 5. We have also started our Cricket coaching, which will lead up to our Cricket Festival on the 7th June at Moseley Cricket Club, which is another fantastic event for us all to look forward to! It has been a great start to the Summer term, with hints of Summer sunshine. Let's hope for more sunshine and continued hard work from all of our fantastic class in 5H. We have been continuing to work hard in 5H and we have had a really good couple of weeks. We have been writing some fantastic, descriptive pieces of writing, where we have been inspired by our book of Narnia within English lessons! We have completed our life cycles unit of work in Science and have now begun our new unit, looking at growth and development of humans. This is a very informative unit of work for the children, looking at growth, body changes and puberty. We have covered this before in Year 4, but it is good to have the chance to enhance the children's understanding of these very important areas. Just a quick reminder to you all to keep practising your times tables and spellings as much as you can each week. Please also make sure that reading is completed 4 times per week. We have had a good week to end this first Spring half term here in 5H. We have continued our work on the life cycles of plants and have moved on to learning about mammals and birds. We have had a very tough week in maths, with a couple of revision lessons to go with our Arithmetic and Reasoning Maths test papers that we have completed this week. The children have all shown improvements in their test scores, which shows that they are getting to grips with the Year 5 curriculum and the learning is really starting to take effect. Well done everyone! We have also completed our Assessment piece of writing for our poetry unit of work and these were fantastic pieces to read! I was very impressed with all of the rhyming, similes, alliteration, metaphors and kennings that the children were able to use! The children all deserve a rest, so have a fantastic half term and I'll see you all in a week! We have all worked hard this week in all areas of the curriculum! The week ended with an amazing Roman Day, where we all dressed as Romans and took part in a fantastic day of activities. We were visited by Professor McGinty, who took us back in time to learn all about the Romans in a hilarious way! We also played some board games that the Romans used to enjoy when they were around. In the afternoon, we learnt some more about the Romans and took part in performing a couple of brilliant Roman songs as a whole year group. I want to thank both the children and families for being so involved in our Roman Day, as it really was a fantastic learning experience for all of the children in Year 5! There are plenty of photos for you all to look at, so please have a look at 5H photos of activities when you get the chance! We have had a busy couple of week here in 5H! We have worked really hard on our performance poetry and have looked at many different types of poems. These poems have covered a wide variety of interesting and thoughtful themes, including bullying, whaling and why Jamaican Turkeys should be allowed to enjoy Christmas! We have worked well on long multiplication and are becoming secure on all four functions through the use of many different word problems, puzzles and reasoning questions. In Science we have seen good progress on our plants with some starting to grow. This will really help us to see the life cycle of plants and the complete process that they go through from seed to flower. We have also been disecting plants in order to be able to name all the different parts of a plant and what they are used for. Please remember that 'Roman Day' is next Thursday, so everyone is to try to wear something to do with the topic. Also, if you haven't had a letter about the Year 6 trip to LLanrug and you want to go, please go to the office to register your interest and to get a letter with the payment information. Have a great weekend everyone and don't forget to have a look at the photos of all the things that we have been up to! We have been back for just over a week now and all the children (and staff) are back into the full swing of things. We have begun our new topic of Poetry within our English lessons, which is allowing the children to show off their reading, understanding and writing of many different types of poems. We have been working hard on place value within Maths lessons, with a key focus on fractions, decimals and percentages. With the key skills becoming more secure, we are now looking at more word problems, puzzles and problems to solve, which challenge the children to understand the question and work out exactly which skills is required. We have also started our new Music topic, where we are looking at a variety of ballads, which we analyse and sing. We are also combining this with singing some great songs about the Romans, which is the fantastic new topic that we have just started this Spring term. It's been a great start to the Spring term, so keep up the great work everyone! The whole class have had a fantastic Autumn term in 5H and I'm very proud of all the hard work that they have put in across all areas of the curriculum. Do check out all of the pictures from the year so far and some of our work from this week on the photos section! Merry Christmas to all.... and to all a good night! ...... and relax... Mr Hughes.... out! The children have continued to work extremely hard this week and have finished the design and making of their stringed instruments. Some worked really well and some have difficulties, but that's the way the arts and crafts business goes sometimes. All the children put great effort into their work and photos are up on our pictures section, so please have a look. We have had our last swimming lesson for the year and I want to congratulate all the children for their hard work and perseverance throughout all lessons. Many of the children have been rewarded for their efforts with a wide variety of certificates, which reflect the hard work that they have put in! We have lots to look forward to, with the Christmas break not far away, however we do have Maths and English assessments that we will be completing next week, so please stay focused until these are completed! We are also looking forward to our carol concert on Wednesday 13th December at 6:00 pm; so please come and join us for a festive sing a long next week! Well, this week has been excellent! We have worked really hard on long multiplication and division within Maths lessons. This has led us to working on factors, factor pairs and common factors, where the children have used their knowledge of times tables to show a good understanding of this. We have been doing lots of research in English, building up to a wonderful non-chronological report on Tutankhamun. The children have used this piece of writing to try to include our grammar work, which includes: Parenthesis, Relative Clauses, Colons, Speech, Subheadings and many more. They have worked really hard on these. We had a great time early in the week with the visit of Olympic Athlete and Gymnast, Dominick Cunningham. The children took part in the fitness circuit with a very positive attitude and we had a fantastic time watching him walking on his hands. We have had a great start to outr D&T unit of making instruments by designing, drawing, cutting, glueing and painting our projects. We will continue with these next week and they will be fantastic when they are finished in a few weeks time :) We have also been very practical in Science, where we all took part in a super investigation into air resistance through the making of paper and cardboard spinners. Well done everyone! Keep up the hard work! What a fantastic week! We have worked extremely hard on many different topics. In Maths, we have learnt how to do long multiplication with both the grid and column methods. We have also done some division and we have even moved on to converting the remainder into a fraction and then into a decimal. (The children have worked so hard on this and their knowledge of converting fractions and decimals from previous lessons really came in handy here). In English, we have been working on debating. We held our very own class debate (which was brilliant, so please look at the photos section) where the children put across their arguments for others to debate. This then led us on to our Big Write, where the children had to write their own two-sided debate with a conclusion. 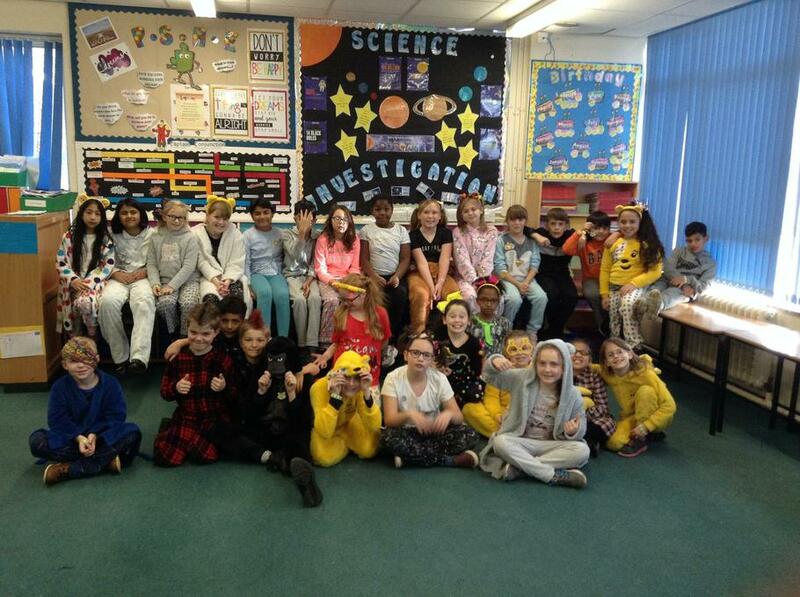 The week has ended with an amazing day for Children in Need. We have taken part in a number of fun activities, including: Teach the teacher, where we learnt how to draw cars, horses and people, do ballet and even learnt some Korean, Free Games Time, Slime Making, Outdoor play , Talent Show and a disco! Possibly, the most rewarding part of the day was at the very beginning, where we watched some clips of children and celebrities from the official children in need site. This really opened our eyes as to why we raise money in the first place and led us to have some really thoughtful discussions about why raising money for children in need is so unbelievably important. I want to thank you all for your donations today, as it is true that every penny does really count towards providing children with better lives. Please have a look at the photos section to see what we have been getting up to today! Also, just a little reminder that we need the boxes and cardboard etc in before next Thursday, so that we can start to make our musical instruments. Many thanks for your help with this. This has been a very busy week indeed for us all here in 5H. The children have been working extremely hard and have been showing great enthusiasm towards all of the subject areas and should be proud of their hard work. Maths has also been full on, with lots of work on fractions. Recently, we have learnt how to use a protractor; now we are able to measure and draw angles accurately and we can even draw an angle of 250 degrees with only a 180 degree protractor! We have moved on to our new topic of forces within Science and we are using of knowledge of Space to look into the forces of gravity and the huge impact that it has on us here on Earth. We have even answered the questions of "How much does an astronaut weigh in space?" and "If you drop two round objects of differing weights (one heavy and one lighter) on Earth from the same height, which will hit the ground first?" These types of questions are really testing our Scientific brains and we are having great fun doing it. Extra cardboard/cardboard boxes - These will be used by the children to create the design of their musical instruments. The children will cut out their design, paint and decorate their design and then put it all together. Extra bits and pieces (if they want them for their design) - For example, an empty wrapping paper / empty toilet rolls may be useful for the neck of the guitar. We will be starting our projects on Thursday 23rd November, so please send your child in with these items during the week beginning Monday 20th November. If you could make sure your child's name is on their boxes/items then that would be a huge help. Please also ensure that your child has their Art apron in school for that week, as we will be painting their designs before putting them together. The final week of this half term has been a very hard working one indeed! The children have completed two Maths Tests (One Arithmetic and one Reasoning), a Grammar test and a Reading Comprehension test. I want to praise the children for how well they have behaved throughout these tests, showing that they understand how important they are to their learning. They have all worked their socks off so I want to praise them for this also. It's not all been tests though, with some great work in P.E, Swimming and Science. We have all taken part in a Science investigation, where we looked into how craters are formed on the moon. We have done this by looking at different sized meteors and asteroids (different sized/weighted balls) and how much impact they would have if they crashed into the moon (flour and cocoa powder). It was a fantastic experiment, looking into the depth and width of the craters formed (as well as being a really fun, messy experiment - apologies for the flour on the uniform ) Please have a look at the photo section of our class page! It's been a fantastic half term and I have thoroughly enjoyed it! The children have worked so hard and have earned a good rest over the holiday. Have lots of fun and come back fully refreshed and ready to go after your break! We have had a super week and have been working really hard on all subject areas. We have been doing some skills tests in swimming, with a number of successful results. Well done to everyone as we are all making excellent progress! Within our English lessons, we have written our own Quest stories; planning , drafting , editing and then writing up in our best handwriting. I am very much looking forward to reading these! I want to thank you all for attending parents evening this week. It was great to meet everyone and I know that there were many positive conversations about the progress of your children. They really are working so hard and are making good progress because of the hard graft that they are putting in! Keep up the fantastic work everyone! This week, we have been really working hard to use our new grammar (Modal verbs, relative clauses, relative pronouns and parenthesis) in all of our written work. We have even begun to use them in Science, whilst producing a non-fiction piece of work on the planets within our solar system! We have been working our socks off on fractions, decimals and percentages in Maths and I would say that we are 80% of the way there to grasping it fully. (Or should I say 0.80 or 0.8 or 80/100 or 8/10) We will be carrying on with fractions, as there are many more fun things to discover! We have also done some cross country running in P.E. to improve both our fitness and stamina levels and ALL the children really impressed me with their attitude and energy within the lesson! Towards the end of the week, we celebrated Green Day and Harvest Festival. You and the children were very generous with the donations for our Harvest Box and it was over-flowing in the hall, so a massive Thank You from me! There are some more pictures up of our fantastic work on Respecting the Environment and Rainforests, so please have a look! I have sent out letters for the Dunfield Trip. Please bring in the replies if your child is interested in going. It doesn't guarantee them a space but it does give us an idea of how many children may want to go. It really is good fun (I went last year), as long as you're interested in the music or arts side of things. What another great week we have had in 5H! In Maths, we have been learning all about fractions, decimals and percentages and how they can all be linked through the magic of converting. We have also performed some drama through the format of an interview. These were fantastic and photos are up! We have been having some amazing swimming lessons, with everyone improving and our P.E lessons are working on the tactics of games, with a focus on coordination skills. What an amazing week! Bring on next week! We've had a fantastic week, working really hard across all areas of the curriculum. In Maths, we have been working on place value; ordering, comparing and rounding numbers up to 1,000,000. We have finished our first short story on the Purple Lady within our English lessons and have written some fantastic summaries of the story. We have also had lots of fun in Science; learning all about the planets in our Solar System and going out on the the playground measuring out the distances between them (with a bit of a smaller scale). Music has also been great; listening to and appraising the two songs of Livin' on a prayer and We will rock you! All the children are working so hard and we even won the attendance award for the first two weeks! Sam the Bear is ours! If we're in school, we're learning!